The Babylonian Empire was relatively short lived (626–539 B.C. ), but it played a large role in biblical history. We have written about all of the Babylonian kings mentioned in the Bible. In this post I am pulling together an index collection of these articles to make it easy for one studying about the Babylonian captivity to locate all of them in one convenient place. Nabopolassar, father of Nebuchadnezzar, destroyed Nineveh here. The Kings of Babylon and Bible History here. Nebuchadnezzar, king of Babylon here. Evil-merodach (562-560) graciously freed Jehoiachin here. Nabonidus, the last king of Babylon here. The big three: Nabonidus, Belshazzar and Daniel here. Babylon ruins reopen to tourists. Repairing the ruins of ancient Babylon. More evidence of Babylonian-Egyptian contacts. More information on Judean exiles in Babylon. Prof. Donald Wiseman – 1918-2010. Riblah – Important in Old Testament history. UN reports Babylon damaged by US troops. Visualizing Isaiah 11: the River. Isaiah 13: jackals & hyenas in the palaces of Babylon. Visualizing Isaiah 13:19-22 – Babylon, never inhabited. Visualizing Isaiah 14: cedars of Lebanon rejoice over the fall of Babylon. Visualizing Isaiah 23: Tyre is laid waste. Visualizing Isaiah 30: not a shard to take fire from the hearth…. Visualizing Isaiah 39: Hezekiah showed all his treasures. 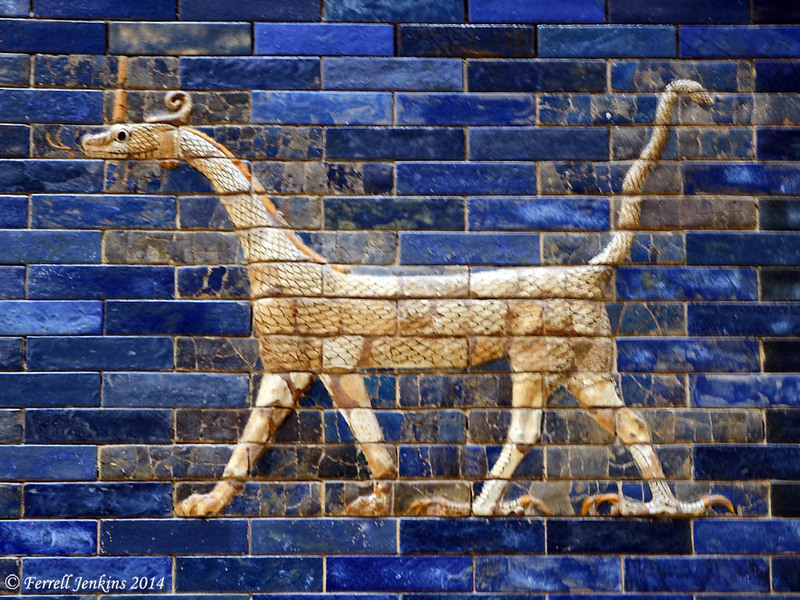 The dragon made of chrome brick on the Ishtar Gate from ancient Babylon was an emblem of Marduk (Museum of the Ancient Near East, Berlin). The dragon is a composite creature with the head of a fire-spewing dragon, body and tail of a serpent, front feet of a feline, and back feet of a bird. This provides a good illustration of the apocalyptic imagery found in the Old Testament prophets and the book of Revelation. Photo by Ferrell Jenkins. The articles below, especially those with an * after the title, are considered minor references. They still might provide some helpful material and photos for the Bible student and teacher. Friday in Jerusalem (and environs). * Ketef Hinnom excavation. The Great Pool at Gibeon. The fourth archaeological expedition to Tel Lachish. Ophel City Walls site opened in Jerusalem. The Philistine city of Ashdod in the Bible. Pisidian Antioch was the site of an important announcement. Ritual bath discovered at biblical Zorah. Ties between Mesopotamia, the Mediterranean, and Egypt. I trust this list will be helpful to students and teachers alike. In the future, when I write something about Babylon I will try to remember to include a link in this index. I would appreciate learning if you find this index helpful. This entry was posted in Archaeology, Bible Lands, Bible Places, Bible Study, Egypt, Israel, New Testament, Photography, Travel, Turkey and tagged Babylon, Babylonian Empire, museums, Nebuchadnezzar. Bookmark the permalink. Mr. Jenkins, I have followed your blogs for some time now, and I really appreciate them and thank you so much. A friend of mine and I are studying the exile of the Judeans now on an online Bible study by Gaylin Weimers and this list of articles is excellent and will really enhance our study. The photographs are excellent in helping us understand what God’s Word says about this subject…..and many others you report on. Also I have been a fan of BiblePlaces for a long time too. I have been to israel 5 times so I have a certain amount of understanding just from being in Israel, but the Bible covers so much more than the land of Israel. Thanks to you and others who report and write blogs and Bible studies, i can get a far greater picture.I am anxious to go back to Israel again, but at this time finacnces seem to be blocking my way. It’s in God’s hands and He will provide a way for me when His time is right. Until then I’ll keep on studying and checking your blogs.God bless you and your ministry of reporting on ” biblical studies, archaeology, travel and photography”.